High priest from 171 to about 161 B.C. 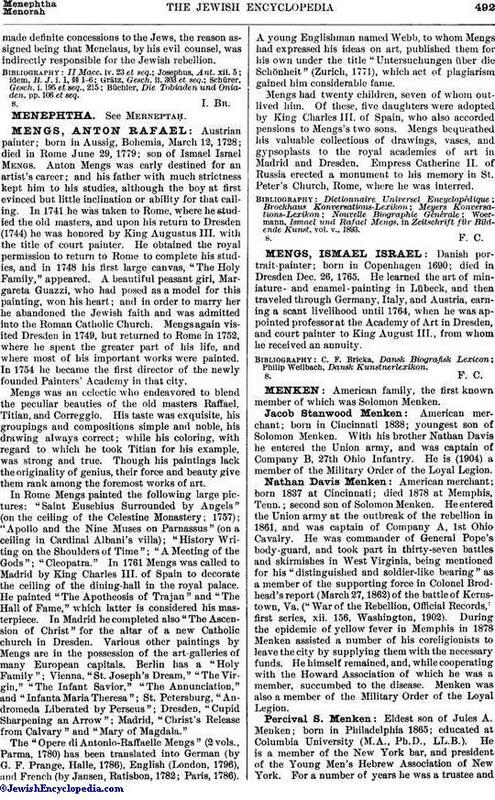 ; successor of Jason, the brother of Onias III. The sources are divided as to his origin. According to II Maccabees (iv. 23), he belonged to the tribe of Benjamin and was the brother of the Simeon who had denounced Onias III. to Antiochus IV. (Epiphanes) and revealed to the Syrians the existence of the treasure of the Temple; according to Josephus ("Ant." xii. 5), Menelaus was the brother of Onias III. and of Jason. 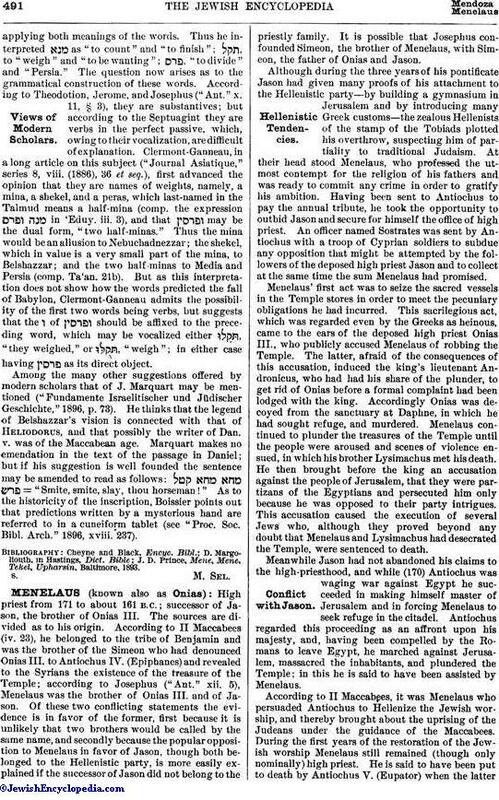 Of these two conflicting statements the evidence is in favor of the former, first because it is unlikely that two brothers would be called by the same name, and secondly because the popular opposition to Menelaus in favor of Jason, though both belonged to the Hellenistic party, is more easily explained if the successor of Jason did not belong to the priestly family. It is possible that Josephus confounded Simeon, the brother of Menelaus, with Simeon, the father of Onias and Jason. Although during the three years of his pontificate Jason had given many proofs of his attachment to the Hellenistic party—by building a gymnasium in Jerusalem and by introducing many Greek customs—the zealous Hellenists of the stamp of the Tobiads plotted his overthrow, suspecting him of partiality to traditional Judaism. At their head stood Menelaus, who professed the utmost contempt for the religion of his fathers and was ready to commit any crime in order to gratify his ambition. Having been sent to Antiochus to pay the annual tribute, he took the opportunity to outbid Jason and secure for himself the office of high priest. An officer named Sostrates was sent by Antiochus with a troop of Cyprian soldiers to subdue any opposition that might be attempted by the followers of the deposed high priest Jason and to collect at the same time the sum Menelaus had promised. Menelaus' first act was to seize the sacred vessels in the Temple stores in order to meet the pecuniary obligations he had incurred. This sacrilegious act, which was regarded even by the Greeks as heinous, came to the ears of the deposed high priest Onias III., who publicly accused Menelaus of robbing the Temple. The latter, afraid of the consequences of this accusation, induced the king's lieutenant Andronicus, who had had his share of the plunder, to get rid of Onias before a formal complaint had been lodged with the king. Accordingly Onias was decoyed from the sanctuary at Daphne, in which he had sought refuge, and murdered. Menelaus continued to plunder the treasures of the Temple until the people were aroused and scenes of violence ensued, in which his brother Lysimachus met his death. He then brought before the king an accusation against the people of Jerusalem, that they were partizans of the Egyptians and persecuted him only because he was opposed to their party intrigues. This accusation caused the execution of several Jews who, although they proved beyond any doubt that Menelaus and Lysimachus had desecrated the Temple, were sentenced to death. Meanwhile Jason had not abandoned his claims to the high-priesthood, and while (170) Antiochus was waging war against Egypt he succeeded in making himself master of Jerusalem and in forcing Menelaus to seek refuge in the citadel. Antiochus regarded this proceeding as an affront upon his majesty, and, having been compelled by the Romans to leave Egypt, he marched against Jerusalem, massacred the inhabitants, and plundered the Temple; in this he is said to have been assisted by Menelaus. According to II Maccabees, it was Menelaus who persuaded Antiochus to Hellenize the Jewish worship, and thereby brought about the uprising of the Judeans under the guidance of the Maccabees. During the first years of the restoration of the Jewish worship Menelaus still remained (though only nominally) high priest. He is said to have been put to death by Antiochus V. (Eupator) when the lattermade definite concessions to the Jews, the reason assigned being that Menelaus, by his evil counsel, was indirectly responsible for the Jewish rebellion. Büchler, Die Tobiaden und Oniaden, pp. 106 et seq.